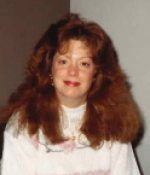 Remembering Tina Winckel Tissot | Remembering Tina Winckel Tissot | De Soto Obituary Search | Dietrich-Mothershead Funeral Home, Inc. Remembering Tina Winckel Tissot | De Soto Obituary Search | Dietrich-Mothershead Funeral Home, Inc.
Tina Tissot was born on July 1, 1959 in St. Louis, MO. She was the daughter of August & Teresa (Bayer) Winckel. She died on April 30, 2018 at her residence in St. Louis, MO at the age of 58. She is survived by her father August “Gus” Winckel of De Soto, MO; her mother passed away on May 25, 2018, just shortly after Tina; her son, Scott Tissot of Florissant, MO; 3 grandchildren; 2 brothers, Gary (Carolyn Fox) Winckel of Valdosta, GA and Jeff Winckel of De Soto, MO. Tina worked as a certified nurses assistant.